All Folkart Slovakia Shepherd Pipes are hand-made from hand chosen upland elder tree. FS shepherd pipes are premium quality woodwind instruments made by hand with precision and good tuning in focus. Our shepherd pipes are used by many amateur and professional musicians in Slovakia and all over the world and are often used on public performances too. Overtone flute ("Koncovka", read [kontsovka]) - duct fipple flute fashioned from a single piece of wood, bored out and plugged at one end. It is end blown, has no finger holes and is one to two feet in length. It is played by covering and uncovering of the bottom hole while blowing it at different strengths. Overtone flute is longer than standard whistle, from 50 cm (key of E) up to 90 cm (key of G). 6-hole whistle - six hole fipple flute similar in construction to Irish whistle. In Slovakia called shepherd's whistle. It can be tuned to major or minor scale of these keys: A, G, F, E, D, C, H with lengths from 25 cm (key of H) up to 60 cm (key of A). Double whistle - combination of 6-hole whistle and koncovka in the same tuning. 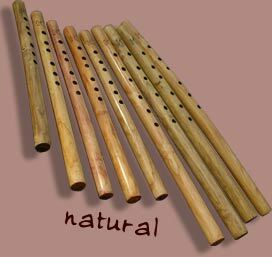 One pipe is classical shepherd pipe with six holes on which the main melody is played. The other pipe does not have holes at all and it enriches the main melody by its 2 overtone base tones - it can be played like koncovka too.